Just one month after the launch, this was the very first moment when TranslatePress was about to have face to face interactions with WordPress users. The plugin is still in its early stage of growth and it was perfectly normal for the attendees to be curious about it, test it, (even break it) and raise questions. For most of them this was the first time they heard about the plugin. This curiosity mixed with the fact that TranslatePress has a completely different approach from all other translation solutions (more on that later), plus the fact that our pop-up banner had a fairly large size, encouraged people to visit our booth. We were a total of five people there, and at least three of us were always around, to answer questions, display the demo and offer guidance. As always, we were impressed by the openness of the WordPress community members, as each of us managed to chat with people of various backgrounds: a lot of developers, freelancers, business owners, and marketing specialists. Personally, this is one of the few events where I didn’t feel any borders between sponsors, speakers, and attendees. It was more like a big family which reunited itself to collaborate. 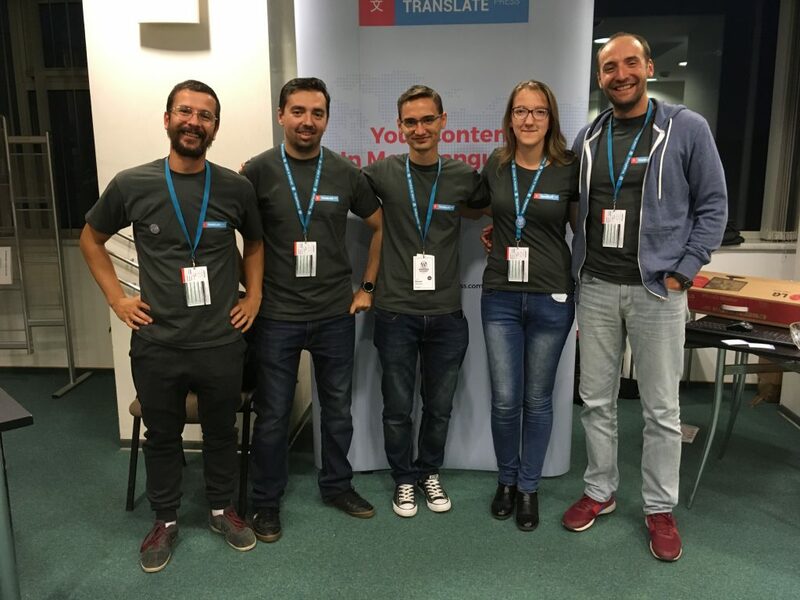 More than that, on Sunday at Contributors Day we met a few folks from The Romanian polyglots team and we were very impressed by their work with WordPress – În Română. As now we are a little bit focused on the translation area, because of TranslatePress, I was curious to learn more about their work. After they made me a quick tour of the platform and how the translation process works, I decided to join the team and contribute as much as I can to the translation of WordPress into Romanian. After we decided to sponsor the event, the next natural step was to think about our booth and how it will look like. Since TranslatePress is a new project, that we launched in September, less than a month ago, we had close to zero design materials. So we started searching for a print agency that would also include the design service. To make sure we are doing the right steps, we met with Alexandra from Captain Form and asked her for some bits of advice regarding the sponsorship process, as they were involved in various WordCamps. This was the point were Alexandra recommended us to work with a local agency that also printed their materials in the past. We talked and decided which swag to bring and went a little wild. We brought in 200 t-shirts, 200 mousepads, 200 stickers, 50 business cars per person and one big pop-up spider. The results, well…everyone visiting our booth got a t-shirt, but we probably overdid it. One of our favorite booths was one of our friends and neighbors from WPZOOM. Same as our experience, they were sponsoring a WordCamp for the first time in-person. Another thing we decided that we would do at WordCamp Bucharest, it was to have a laptop and big display on which we will run TranslatePress Demo. This is why the colleagues from the development team worked together to have the site working for the conference. This was probably one of the key ingredients of properly showing the plugin to users. Because TranslatePress is meant to make translations fast and intuitive, by allowing you to translate all strings on your site directly from the front-end (using a friendly interface), people generally needed less than a minute to understand how the plugin works and some got pretty excited. Having a demo meant participants could directly test the features of TranslatePress, play with its (few) settings and quickly translate a site. On the other hand, we had a point from were to start many conversations, which lead us to various feedback. Some days before the event we had a discussion on how to approach the overall process and come up with a plan. That was the moment when we started looking at the attendees’ profile. There wasn’t much information there, only the name of the person and a Gravatar (a link to their website or Twitter like this – it might help, next time). To sum up all the research, we built a spreadsheet on Google Docs and worked together to scan the 200+ attendees and fill in some contact forms, email address, and a little bio. This research and document was our starting point on reaching out to freelancers, developers, web development agencies and theme shops to ask for an opportunity to meet & chat in Bucharest. A few days after WordCamp Bucharest we are at the point where the real work just begins. We exchanged a lot of business cards, discussed possible partnerships. Now it’s time to find a way on how we can help developers, agencies, theme shops and freelancers with TranslatePress. Almost every person that came to our booth offered us valuable feedback, ideas for improvements and some even found a bug or two that need to be fixed. We have documented each one of them and added some to our development plan. 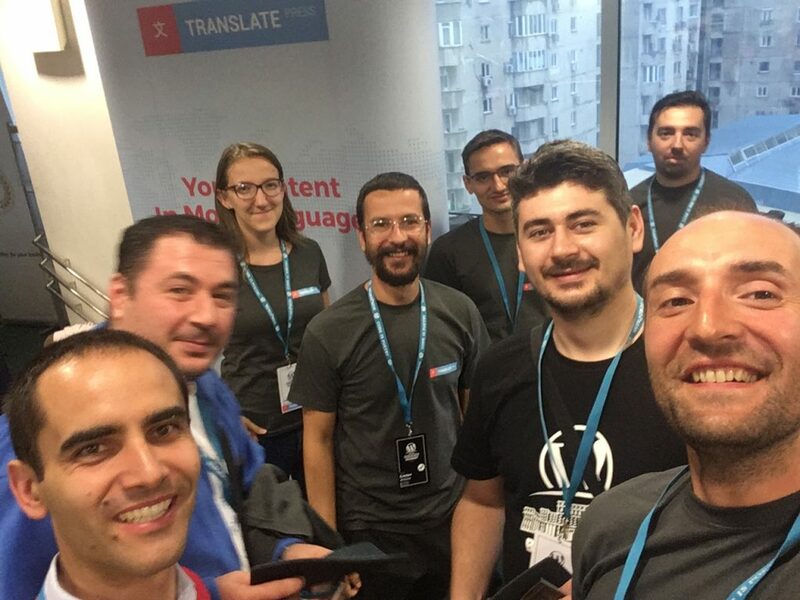 Our colleague, Cristian Antohe also applied as a speaker with a presentation on “WordPress in More Languages“. As you can see in the link, he talked about localization, theme and plugin translations, multilingual plugins and offered some SEO tips for multilingual sites. During the speech, almost everyone from our team was caught in various conversations at the TranslatePress booth, so we didn’t get the chance to hear the presentation. Alexandra Draghici (How to build an education website with WordPress). However, soon after the presentation, there were more people coming at our booth, with more targeted and specific questions. Attending & sponsoring a WordCamp can help you put a new product on the map – if you are doing some research before and prepare an action plan with clear steps to follow during the conference. People are open to provide feedback, which you can build upon. Having a booth makes it easier to talk about your product(s) Having a sponsor booth is the perfect conversation starter. People that come by are already curios about what you do, so having a demo ready will make things easier. WordCamps are pretty inspiring events You meet a lot of passionate people, the big majority of them willing to help and share valuable insights with you, all of this in a super friendly environment. P.S. We did it again in 2018. See how it all went down in our second Transparency Report.